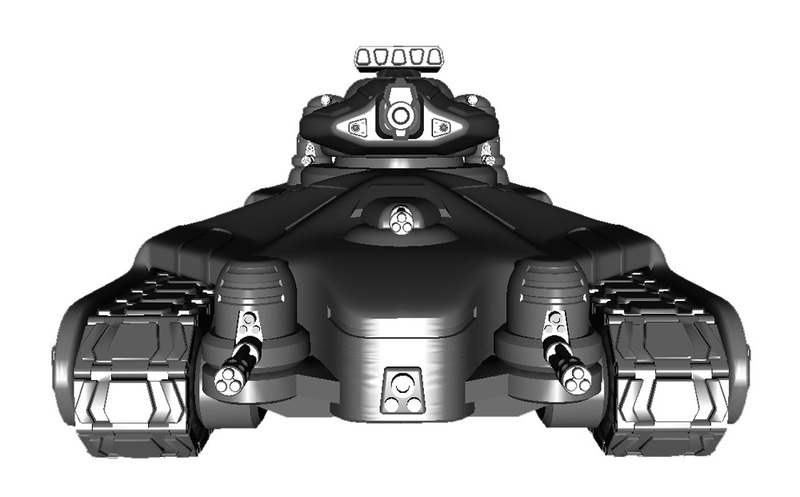 The Gilgamesh Command Tank for Utopia is a model that has been in development for a long time. Originally there were a number of ideas starting as a regular tank, though slightly larger than normal to a kind of super Hittite, a kind of Armored Fighting Vehicle for the south, to a massive hover N-KIDU factory. The design for the vehicle was always to be a command node for a N-KIDU based Utopian army. The idea was that a large tank could have a powerful communications system to coordinate a very large number of drones at one time. Originally the concept was more of an armored train pulling factory cars but that was discarded early both as a logistical problem for the rules as well as a nightmare for the cost of producing such a model. Read on for some thoughts about decisions we made regarding this centerpiece model. Robert and I spend a several meetings working out the general principles of the Gilgamesh. I had already build a scaffolded layout of what I thought the attributes should be. It would not make any sense for the Gilgamesh to take any kind of the support fire role away from the Support Armigers or the incoming Ettin heavy N-Kidu. It was decided that the tank would be a ground vehicle and be very low, sleek, high tech looking vehicle. It’s a high value asset and the Utopians have to protect it from melee and close in attacks from enemy Gears. The choice was if we were going to experiment with having the Gilgamesh create N-KIDUs that it could then deploy was a difficult one. There is writing in the back story where automated drone factories roll around making small armies of N-KIDUs but we wanted a command vehicle, something that was designed to control the N-KIDU swarms and support them with significant firepower. As a main gun the choice wavered between a Heavy Laser Cannon (HLC), a Heavy Particle Accelerator (HPA) and a Heavy Rail Gun (HRG). In the end the choice was made that as a support vehicle the tank would have an outsized Heavy Particle Accelerator, upgraded to a penetration rating of 10, as a support weapon. The Haywire effect is extremely powerful combined with multiple Tank Missiles cheaply available through the Support N-KIDU and the heavier missiles on the Support Armiger and new ISKR Ettin heavy auto. This plus the fact that the MPA would be the signature weapon of the ISKR Ettin means that the signature heavy direct weapon of Utopia would be a weapon that promoted combined efforts, perfect for an army of coordinated drones. The Heavy Anti-Vehicle Rocket Launcher (HRP) is also a AE:4” weapon giving it a potentially huge effect targeting multiple enemy targets at once using the Spit:2 trait given by Link (from the update). The Support Turret loses a lot of useful traits but replaces the HPA with a gigantic Snub Cannon. An innaccurate weapon normally but on a stable tank it’s a powerful option. Great for destroying terrain and fortifications your opponent is using to protect themselves. Since the Mk2 beta rules were released there has been a lot of work completed on the 3D model for the Gilgamesh and with these changes often comes adjustments to the rules to tweak the model to make it closer to what the model represents. In the case of the Gilgamesh a pure combat tank became upgradable to a recovery and repair vehicle as Jason created some very cool robotic arms that could be mounted on the rear of the tank in place of some of the guns. This gives the opportunity to enact some repairs in the field to N-KIDU and Armiger models in addition to protecting itself from melee attacks from the rear, a significant danger to Tanks. It is worthy to note that the Gilgamesh cannot use the mechanic trait on itself. This is represented by the associated trait “(Transported Model)” meaning that only models that can be transported by the Gilgamesh can be repaired. This is because it is not the large waldo arms that do the repairs but smaller waldo's that come from panels and recesses on the flatbed. I also really liked the visuals of the drone tank placing a fallen Utopian Hero in their Armiger suit on the flatbed and carrying it back to their lines. Do N-KIDU models have a protocol for humans killed in action? It’s not an important question for the rules but a great diorama could be made using that as a theme. Another thing that we addressed was the speed of the model. 6” is quite fast for such a large model allowing for some dynamic displacements on the table. At first the tank only had a movement rate of 4” but it was thought that a higher rate would emphasize that this is a very high tech tank. The limitation of ground movement is slightly offset by the Offroad:X trait but the limitation of Ground movement (one turn per move) means that a tank this big will have some issues maneuvering around the table. Stable makes this a very effective threat even when gunning at top speed. The unique nature of the positioning of the weapons on the Gilgamesh will require a more detailed Arcs section in the core rules (see 2.11) adding in the arc Fixed Forward and defining what is Front and Back and how combinations of arcs work. This will be added with the MK3 beta update and in the FAQ Errata right away. Aren’t living rule books great? We haven’t needed these arcs before now and being able to update a small but necessary part of the rules is excellent, as long as it isn’t done too frequently. Stock Gilgamesh: 90mm wide, 62mm tall, 191mm long (7.5” long). Stock HHT-90: 124mm wide, 66mm tall, and 160mm long. Stock Kodiak: 42mm wide, 48mm tall, and 35mm long. That’s right. The Gilgamesh will be the largest model ever produced by Dream Pod 9. Making it that big was a difficult choice. Larger means more expensive and can mean issues fitting on the table but then again when you have a faction like Utopia that has been dreaming of a true centerpiece model you just have to go all out and make something really impressive. Plus we wanted the transport pontoons and flatbed to actually fit the new Utopian Drones that we were making. The Support modules were a very interesting choice. By placing a rule directly with the model about being able to include 0, 2, or 4 modules it’s also done something very interesting for a tank. Effectively the Gilgamesh has it’s own cover that it transports around. Any attacks targeting the body of the tank from the sides will allow the Gilgamesh to use 7.1a: Intervening models as cover to get +2D6 to it’s defense roll. If the attack misses then the support module that was used as cover will have to make a defense roll against the attack but 2TV for a Transport module to use as ablative armor is a small price to pay. This does something very interesting where the Gilgamesh player is always angling the tank for the best use of table cover and the support module cover while also trying not to expose the rear arc of the tank to fire. It creates a tank that actually constantly moves itself for the best position. 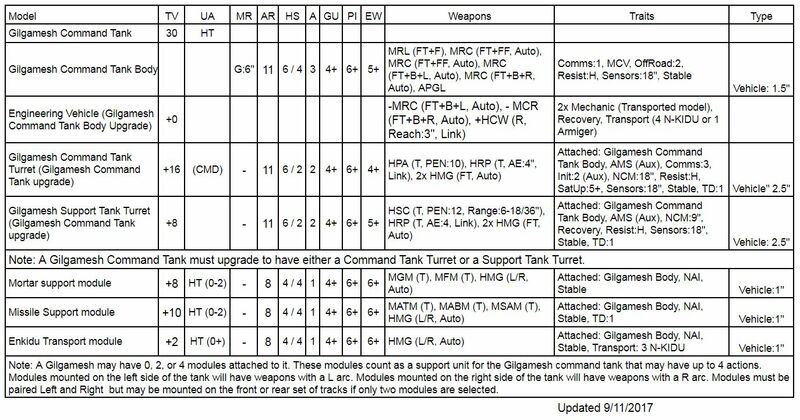 In addition a player can plan a playstyle where the right modules are the more expensive weapon modules and the left modules are the cheaper transport modules and deploy so that the tank body blocks lock to the right weapons modules. Of course like all models if the modules are destroyed they will become a wreck and will in effect detach from the Gilgamesh and remain as cover with a height of ½”. This is good, as an opponent can shoot the pontoons off and deprive the Gilgamesh of it’s mobile cover! The Gilgamesh is one of the most exciting models that Dream Pod 9 has ever created. With the kickstarter just around the corner will you be starting a new Utopian Army? Things to note are the HSC on the support turret getting a range boost, the AMS trait getting the Aux trait, the addition to stable to the turrets, and notes about how the modules must be attached. The option to remove two rotary cannons in favor of the ability to do repairs is also significant, especially if you have an Armiger Duelist/Ace you need to keep in the fight. And a special preview image of the Tank from the viewpoint of a Hunter about to get run over! We’re looking forward to previewing more images of the Gilgamesh soon. Keep your sensors active and join the discussion on the forum.